The history of coastal catastrophic floods was reconstructed for the first time using the geochemical proxy in shelf sediments. The reconstruction is based on the identification of sediment layers accumulated on the shelf during the intensive discharge of the river runoff suspended matter from the land which does not contain bromine. The set of isotopic (AMS 14C, 210Pb, 137Cs), tephrastratigraphic, and paleomagnetic methods was used for the detailed chronology of sediments. The scanning of chemical composition of sediments with the step of 0.5–0.8 mm is performed using the synchrotron radiation X-ray fluorescence in the VEPP-3 storage of the Institute of Nuclear Physics of Siberian Branch of Russian Academy of Sciences. 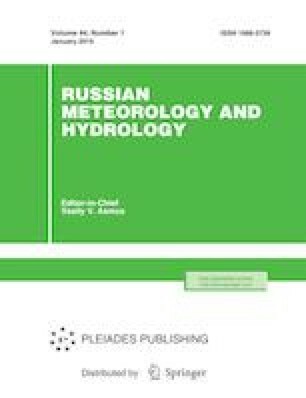 The history of catastrophic floods for the past 1800 years is reconstructed based on the typical variations in bromine concentration in one of the cores from the Amur Bay (the Sea of Japan). New methodological approaches to the flood signal extraction are proposed. The revealed inverse correlation between the frequency of floods caused by typhoons over the coast of the Sea of Japan and southern China agrees with the existing assumption on the change in their trajectories in different periods of global climate change. Russian Text © A.S.Astakhov, A.V. Dar’in, I.A. Kalugin, K.I. Aksentov, 2019, published in Meteorologiya i Gidrologiya, 2019, No. 1, pp. 91–102.